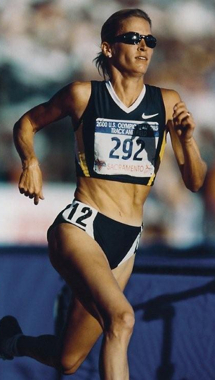 Suzy Favor Hamilton started running in fifth grade while at Washington Elementary in Stevens Point, WI. The setting was an annual event where five area elementary schools competed in various track distances. Suzy ran the 400. There were no separate boys and girls races. Coming down the home stretch she was not just ahead of all the girls, but the boys too. No girl had ever beaten all the boys - she did. The spectators went crazy. She looked up into the stands and watched in disbelief as parents, teachers and classmates were chanting, 揝uzy! Suzy! Suzy!� She says this was a defining moment in her life. She was hooked and has been running ever since. From that day evolved one of America抯 premier middle distance stars. While at Stevens Point Area Senior High she won 11 state championships and posted times of 4:18.62 (1500) and 4:42.5 (1600). She was named one of the top 100 High School Athletes of the Century by Scholastic Sports Magazine. While visiting her sister at the University of Wisconsin (not on an official recruiting visit) the track coach asked Suzy to have dinner with the team. She did and decided Wisconsin is where she抎 attend college. She left there with 9 NCAA and 23 Big Ten Championships. She was named the Big Ten Athlete of The Decade for the 90抯 and NCAA Woman of The Year. Following her collegiate career Suzy qualified for 3 U.S. Olympic Teams (�, � and �). She抯 run under 4:00 for the 1500 five-times with a personal best of 3:57.40. She抯 won 7 U.S. Championships. Suzy currently resides in New Glarus, WI with her husband Mark and daughter Kylie (2-1/2).